Having satisfied the palates of distinguished travelers for the past 170 years, Cunard Line continues this tradition as it announces the fine restaurants and bars aboard the Line’s newest ship, Queen Elizabeth, debuting this fall. Guests will be treated to an array of experiences, some of which pay homage to fondly remembered venues on the fleet’s predecessors and others that expand upon the successful restaurants and bars currently aboard sister ships, Queen Mary 2 and Queen Victoria. The venues will exhibit art deco flourishes, rich wood paneling, intricate mosaics, gleaming chandeliers and cool marbles, each having a distinct design that enhances the room’s purpose and recalls the much loved traditions of Cunard Line. Whether guests look to participate in traditional British tea service, meet up with friends for a cocktail, indulge in a sumptuous meal or find a quiet table to enjoy a nightcap, they will find themselves surrounded by elegant décor, treated to Cunard’s signature White Star Service TM and the finest in food and beverage offerings. Heading the multi-layered culinary program is Cunard’s renowned Global Culinary Ambassador Jean-Marie Zimmermann, who continues to define the culinary standards for excellence aboard flagship Queen Mary 2, Queen Victoria and now Queen Elizabeth. In their day, The Verandah Grills on Queen Mary and the original Queen Elizabeth were perhaps the most exclusive dining rooms at sea, on a par with exclusive private clubs in London, New York and Paris. On the former Queens, The Verandah Grills were available to first-class passengers who wanted a truly exclusive experience. The rooms would be frequented by royalty, film stars, the rich and the famous. In keeping with this tradition, The Verandah restaurant on the new Queen Elizabeth will offer an experience that encompasses exquisite cuisine, contemporary design and impeccable service. With menus created by Chef Zimmermann, The Verandah, located on Deck 2, will be a celebration of fine French cuisine, paying homage to the chef’s homeland. A light and elegant room, views of the ocean and the Grand Lobby will set the tone for a distinguished dining experience. The art is inspired by the playful and whimsical murals on the first two Queens and the vintage menus tell a story of the dining experience on board the original Queen Elizabeth. Guests will experience an emotional link to those that dined on the original Queen Elizabeth whilst enjoying the very best in French Cuisine. The dishes served will take guests on a culinary journey through France, evoking the special personality and flavor of regions such as Périgord, Pyrenees, Alsace, Bresse and Burgundy. Sourcing products from the finest purveyors, including many in France, Chef Zimmermann will combine these with the best methods to achieve the quintessential taste experience. Guests can look forward to enjoying culinary masterpieces, such as Monkfish and Rascas Fish Bouillabaisse, Magret Duck, Baked Brie de Meaux Brioche, and Hot Vanilla Soufflé infused with Edmond Briottet Peach Liqueur. The anticipated alternative restaurant will be open for lunch and dinner for a small surcharge. The restaurants will follow a similar pattern to the award-winning Queen Mary 2 and Queen Victoria, with the Line’s celebrated five-star Queens Grill and Princess Grill restaurants being offered to those guests in Grills suites. Both the Queens Grill and Princess Grill restaurants will be located on top of the ship (Deck 11), enclosed by graceful and gently curving panoramic glass walls on the seaboard sides, and cantilevered out over the side of the vessel above Deck 10. The Grills restaurants will offer a single seating, allowing for guests to enter at a time of their choosing. A la carte menus will be featured in both restaurants, featuring classic dishes Cunarders have come to know well and some new specialties. The restaurants, although architecturally similar, will be decorated distinctly in an Art Deco fashion to create an individual feel in each dining room. Grills guests also will have exclusive use of their own private bar and lounge, conveniently located next to the Grills restaurants, complete with resident Concierge. French-style doors will open from each Grills restaurant onto the Courtyard, an exclusive patio area, where al fresco dining will be offered. Steps will lead up to the Grills Terrace, a secluded retreat that is on the ship’s uppermost deck, where Grills guests can enjoy luxurious sun beds and dedicated waiter service. The main dining room, the Britannia Restaurant, is destined to be one of the most remarkable dining rooms at sea, spanning Decks 2 and 3 at the stern of the vessel. Art Deco decorative flourishes create a dramatic backdrop for this two-tiered dining room that is sure to evoke memories of classic ocean liner restaurants. A sweeping staircase, ideal for making a grand entrance, and a backlit decorative ceiling are among the focal points. Breakfast and lunch will be served by open seating and guests have the option of either early or late sitting for dinner. Like Queen Mary 2, Queen Elizabeth also will offer the Britannia Club, where guests traveling in AA category staterooms will enjoy single-seating dining at a time of their choosing. New for Queen Elizabeth is that this is a separate dining room. The exclusive dining room will be rich with art deco flourishes, a beautiful ceiling with backlit decorative glass panels, a sand-blasted decorative glass wall and panoramic windows for sea views. Open 24 hours a day, The Lido Restaurants on Deck 9 will be light, spacious, casual areas with wonderful sea views. Taking note of the cuisines from the exotic destinations that the Line visits during its legendary World Voyages, the Cunard culinary team presents a range of global dishes, offering guests an array of gourmet options that are sure to satisfy any palate. During the day, breakfast and lunch will be served buffet-style.
. Asado – The true essence of South American cuisine, Asado will feature the traditional style of cooking meats on a grill. Guests may choose from a selection of dishes from the Rotisserie and Grill, such as Roasted Chimmichuri Chicken and Argentinean Lamb Chops with Pistachio.
. Jasmine – Pan-Asian cuisine, drawing on influences from Japan, Singapore, Indonesia, Thailand and China. Tantalizing dishes are inspired by the many flavors of the region, producing dishes that range from Aromatic Crispy Duck to Char Siew Pau. Named after a room on the first Queen Elizabeth and inspired by the glass houses at Kew Gardens, The Garden Lounge will be a palm-filled conservatory with a magnificent vaulted glass ceiling, making it a truly light and airy place to sit by day. Murals of garden parties gracing the walls will lend to the open and whimsical feeling of the room. On select days at sea, the venue, located on Deck 9, will serve Champagne afternoon tea service, featuring Veuve Clicquot Champagne, for a surcharge of $25 per person. Occasional evening “Supper Clubs” will present guests with the opportunity to mix dining with dancing under the stars. Small plates of savories and sweets will be served while live musical entertainment is presented. As a successor to Queen Elizabeth 2, the ship also will reflect this great liner via artwork and memorabilia and will have its very own Yacht Club, named after the lively aft lounge on QE2. Located on Deck 10, the nautically-themed room will offer guests 270-degree views and the perfect setting for activities and gatherings during the day. It also will double as a dramatic evening venue for cocktails and dancing. The Yacht Club will re-create the much loved ambience and experience that was so appreciated on board QE2 for many years. The original Queen Elizabeth will be celebrated in the Midships Bar on Deck 3 in a space named after one of the more popular spaces on the original ship. Cabinets will house memorabilia from that liner with artwork reminiscent of the 1930s and 1940s. A piano will provide the perfect opportunity for lively musical evenings in the intimate lounge and – as they did on the original Queen Elizabeth – guests will meet at the end of the day to share the news and happenings of the day. Queen Elizabeth will offer a range of bars and clubs to suit a wide range of tastes with a variety of atmospheres. On Deck 10, guests will find the Commodore Club, a nautically-themed observation lounge, similar to that on Queen Victoria. Rich leathers and wood paneling give the feel of a classic private club. Maritime buffs will be treated to models of the entire current fleet, as well as murals depicting the liner and the historic moment when Queen Elizabeth, Queen Mary 2 and Queen Victoria met in Southampton. Providing extensive views over the ship’s bow and a host of intimate seating areas, the space is the perfect venue to enjoy a martini, cozy up with a novel or just watch the world float by. Due to the popularity of Café Carinthia on Queen Victoria, this inviting lounge will return to Queen Elizabeth and offer guests even more space to enjoy conversation and libations. Touting a leaded-glass ceiling, marbles and Art Deco touches, the space will be a beautiful retreat where guests will be able to choose from a selection of sweet pastries, fine teas and coffees. Located in a central position on Deck 2, overlooking the Grand Lobby, the Café is an ideal place for people watching. The Golden Lion Pub, another Cunard signature, will offer English pub food for lunch in a traditional British pub setting. From fish and chips to shepherd’s pie, guests will be able to enjoy a taste of the United Kingdom, no matter where in the world the ship is sailing. They also can select from a variety of ales and catch a sporting event on the plasma screen televisions in Cunard’s popular pub, located on Deck 2. Queen Elizabeth’s two-deck Queens Room ballroom, another Cunard signature feature, is designed for traditional English afternoon tea service, complete with finger sandwiches and freshly baked scones with jam and cream, served by white-gloved waiters. Musicians will play soft melodies, creating a soothing background for this civilized custom that has become a Cunard hallmark. This grand room on Decks 2 and 3 highlights Cunard’s royal links and traditions and will have murals inspired by views from royal palaces and a photographic collection of Cunard’s Royal ship namings. Queen Elizabeth will be the second largest Cunarder ever built and will join her sisters, Queen Mary 2 and Queen Victoria, as part of the youngest fleet in the world. The first Queen Elizabeth was one of Cunard’s greatest ships, and the new Queen Elizabeth will reflect her predecessor in interior grandeur, décor and style, but with a modern twist. 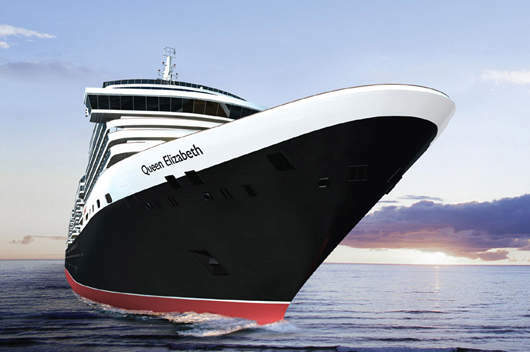 Queen Elizabeth will depart on her Maiden Voyage on Tuesday 12 October 2010. 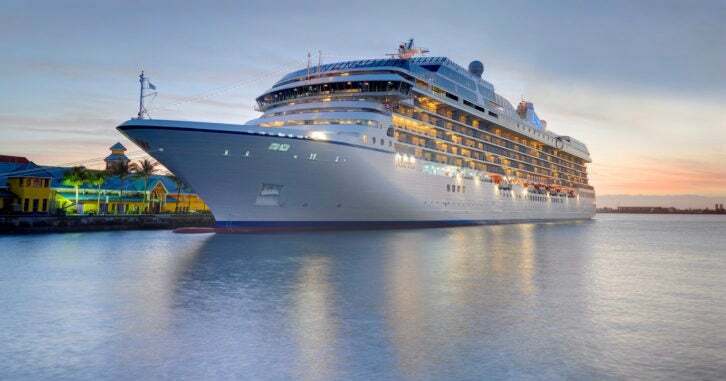 This 13-night celebration will leave from the company’s home port, Southampton, and will call at Vigo, Lisbon, Cadiz, Las Palmas, Santa Cruz de Tenerife (overnight call) and Funchal. She will then embark on five celebratory maiden voyages to the Mediterranean, Northern Europe and the Caribbean.